Predictable and misguided, the first two feature-length episodes of "The Romanoffs" are so bad it's almost unbelievable. They’re back: Matthew Weiner’s laundry lists of forbidden plot points. In the days of “Mad Men,” screeners for each new season, half-season, or episode came with a laundry list of spoilers critics could not include under penalty of death, and similar letters have become so prevalent they’re now parodied by other creators. With “The Romanoffs,” those special requests have resumed. However, this review of “The Romanoffs” is relatively brief for reasons that have nothing to do with censorship: The first two episodes of Weiner’s Amazon Prime series are a serious disappointment. There’s not enough to spoil beyond the show’s many, many missteps. For the first time, Amazon Prime will release one new episode of this anthology series per week for eight weeks, departing from its usual approach of releasing the full season at once. Each installment appears to be feature-length. (The first two clock in at just under 90 minutes each.) Each tells a fresh story about a different member of the Romanoff family, with tidbits of their history doled out to help tie all eight episodes together. Little else is known (or can be said) about a fictional family who persevered despite a bloody past, but both episodes provided for review are as predictable as they are hollow. Episode 1, “The Violet Hour,” is set in Paris, where we learn that there are few remaining Parisian family members obsessing over a luxurious home. Presently, it’s owned by Madame LaCharnay (Marthe Keller), while her doting nephew Greg (Aaron Eckhart) and his cruel girlfriend Sophie (Louise Bourgoin) wait for her to turn over the apartment to them. Enter Hajar (Inès Melab), a Muslim housekeeper and student whom the dear old aunt berates with racist assumptions and accusations. “I need a caregiver, not a terrorist,” LaCharnay says, and the two go on to argue over everything from Hajar’s hijab to her lack of a husband. It’s difficult to say more without running afoul of Weiner’s spoiler edicts, but it’s unclear what the episode is meant to represent, if anything. Is it an examination of what makes an ancestry worth preserving? Here, the Romanoff family’s flaws seem inherent to their privilege, but their story lacks sharp contrasts. It’s not satire. It doesn’t end with a damning punctuation beyond comeuppance for one vile party and a salvation for another more subtle villain. All of the major characters are terrible people, except Hajar; the one pure character within this story isn’t so much uncorrupted as she’s obliviously diminished by Weiner’s pen. It’s an irritating watch that, aside from a few committed turns, doesn’t reward the feature-length slog. Episode 2, “The Royal We,” is better, but only like fainting from exhaustion is better than fainting from a heart attack. Married couple Michael (Corey Stoll) and Shelly (Kerry Bishé) are stuck in a rut. During a counseling session, Michael confesses he can’t think of a single thing that he wants to do. Meanwhile, Shelly’s content in her bubble of romantic comedies, weed, and pizza. Before you get the wrong idea, some blunt, expository dialogue makes it clear Shelly works; moreover, she’s the boss of the couple’s shared business, but that’s all that keeps her from succumbing to a complacent-housewife storyline. Opportunities for excitement present themselves to both partners (one during jury duty, the other on a cruise), but their takeaways from each new enticement send them in wildly different directions. The idea that a man is so bored he can’t think of a single thing he wants to do might suggest the kind of neurotic comedies Woody Allen used to make, but what grabs Michael’s attention is pedestrian and gross, like the creepy, off-key comedies Woody Allen used to make. 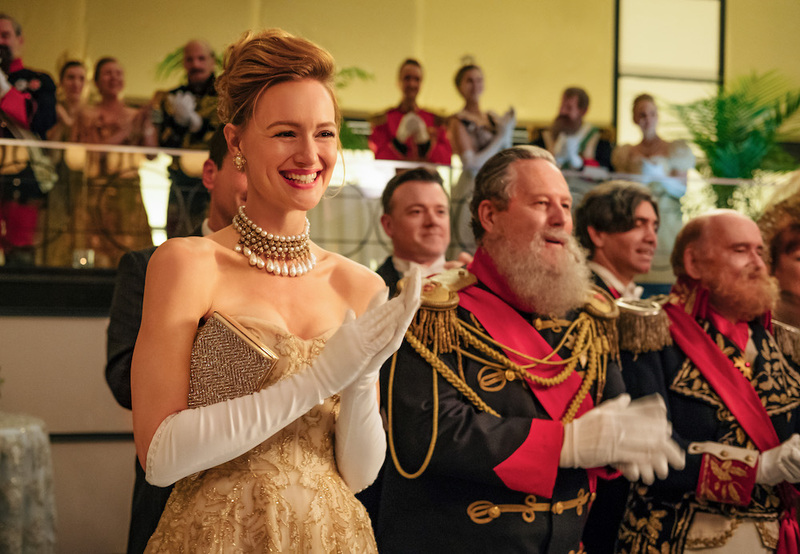 “The Romanoffs” deserves to be compared to another Allen catastrophe: “Crisis in Six Scenes,” the 2016 limited series that stemmed from Amazon throwing so much money at the writer he couldn’t say no. Such unchecked power seems to have steered Weiner wrong as well. The writer (or co-writer) and director of every episode relies too heavily on the general mystery surrounding the family to drive interest, and his running times are unforgivably self-indulgent. While the production team has done fine work, from the elegant costuming to lush real-world locations, these episodes don’t deserve their length, especially with Weiner’s uninspired framings and tepid pacing. Episodic arcs always leave the possibility for improvement. Each week offers new characters, stories, and ideas. Hope springs eternal — after all, “Mad Men” did spring from somewhere within this man’s mind. But his new series take pains to erase elements that made the AMC drama so very good. Don Draper’s bad behavior is consistently criticized, and Peggy Olsen’s journey is treated with honesty and empathy. But “The Romanoffs” provides an irrefutable defense of its bad men and shows contempt for some of its most prominent women, without providing meaningful reasons for either. If these episodes find “The Romanoffs” putting its best foot forward, then it’s best not to keep step. “The Romanoffs” premieres its first two episodes Friday, October 12 on Amazon Prime. A new episode will be released each Friday through November 16.